Since the year dot there has always been a need for navigational aids when travelling, especially in unfamiliar landscapes. It is known that the Romans introduced milestones whose use continued well into the nineteen century. These were later replaced by the road signs of today and thanks to GPS have been enhanced by guidance systems. What did travellers do in prehistoric times? It is fairly certain that they used landscape features to aid navigation which took them along traditional paths and trackways. We will never know what fears and superstitions lay along these ancient routes but what we do know is that they continued well into the Victorian times and in some cases to this very day. So what has all this to do with the Charles Wood Cross? If you look at the map extract opposite you can see three important features, firstly two Iron Age forts; Cranbrook Castle and Prestonbury Castle. Secondly you can see the old trackway leading down through Charles Wood and lastly a ‘stone’ feature marked. So time to speculate, it is known that the two ‘castles’ are hill forts dating back some thousand years or so. It is unknown how old the trackway is but it could be possible that it dates back to the Iron Age and was used by travellers between the two forts? It is known that in later years the trackway was used by the colliers or charcoal burners for transporting the pack horses loads to and from their kilns. OK, so the ‘stone’, this in all reality can be classified as a waymarker, again some more questions, how long has it been located at this location and did it replace something that was there previously? With regards to how long it has stood besides the track the quick answer is that nobody knows. What is known it that in 1902 William Crossing wrote the following about the stone; “It will be found beside the zig-zag road that leads from Cranbrook Castle to Fingle Bridge, on the right side in descending at a point where a path of which there are several, diverges from the main one. Mr. Ormerod took a photograph of this stone in 1863, but it would appear that afterwards it was thrown down, for writing in 1874, he states that he had not during a few years previous to that date been unable to find it. In the same year I also visited the woods, and passed down the road from Cranbrook, but could see nothing of the stone. It has, however, been for a long time replaced.”, p.137. So the earliest confirmed date of the stone’s existence is 1863 when Ormerod took a photo of it. Crossing also hints at a reason for its location, to act as a waymarker at a crossroads of several tracks, as can be seen on the map opposite. Those tracks were probably used by the charcoal burners which may well point to the idea that it was they that placed it there at some point in time? Why is a ‘stone’ listed in the category of Dartmoor crosses? Simply because on its north-western face there is an incised cross. The actual stone measures about 1 metre tall with a width that tapers upwards from 0.6 metres to 0.4 metres and a depth of 0.25 metres. The actual incised cross is 38 centimetres in height with a span of 26 centimetres. Sandles, p.26. Again another couple of questions; why would a simple stone serving as a waymarker have the Christian symbol of a cross incised on it? Was the cross incised on the original stone or was it added at a later date? Try to imagine that you were a traveller using the track some two to three hundred years ago. You are walking through a deep dark wood and have a firm belief and fear of ghosties, ghoulies and things that go bump in the night. One of the superstitions of the times was that unearthly spirits travel in straight lines or ‘flight paths‘. Therefore when they reach a crossroads where several paths intersect they become confused not knowing which way to go. Arguably then, such locations would be the places where a traveller was most likely to encounter such supernatural entities. So what better way to reassure folk than carving a Christian cross on something located at a crossroads thus providing divine protection from any evil lurking there? There you have it – Charles Wood Cross or what very little is known about it. If ever in the area have a stroll up or down the old trackway and pay a visit to the stone. Imagine all the ancient footsteps that have wandered down the old track and decide for yourself as to the purpose of the stone. Was it simply a waymarker or were there more superstitious reasons for it? Crossing, W. 1902. 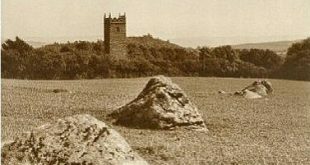 The Ancient Stone Crosses of Dartmoor and its Borderland. Exeter: James G. Commin.